Get ready for a fun-filled afternoon that celebrates the kid in all of us: The 2019 kid-free Spring Fling & Adult Egg Hunt at Dorothea Dix Park - a field day for adults! Bring your friends (21+) and get ready for an epic adults-only Egg Hunt with over 20,000 eggs, inflatables, and lawn games. As one of our most talked about events from last year - you don't want to miss it! New for 2019, we are taking the egg hunt to the next level. Along with the frenzy of finding eggs filled with candy and prizes from local businesses scattered throughout the field, participants will have the chance to win big ticket prizes during the new Golden Egg Scavenger Hunt. Clues will be given via our Dix Park Instagram (@dixpark) with photos and hints guiding you to where the eggs are hidden throughout the park. Get ready, our partners at Pulse FM are providing the awesome prizes for the each of the golden egg winners! Come for the hunt, stay for the party. Gather with friends and bring the picnic blankets but don’t worry about packing the picnic – we’ll have Tacos Las Gringas, Barone Meatball Company, Rare Earth Farms, and Two Roosters Ice Cream offering food and desserts along with Compass Rose Brewery, Carolina Brewing, and Lonerider Brewing serving up local beer. 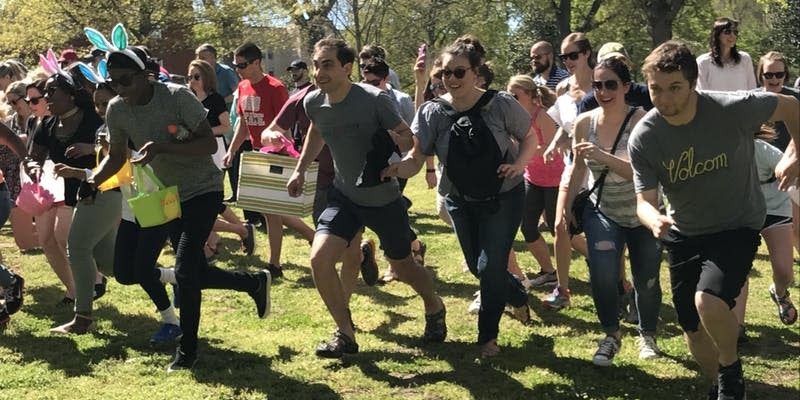 Spring Fling & Adult Egg Hunt is brought to you by the City of Raleigh Parks, Recreation and Cultural Resources and the Dorothea Dix Park Conservancy.